People talk about price as if its the only thing you negotiate. Its not obviously, but pricing can have interesting impacts on your business and the the timing of your sales. I was at a family function many years ago when an older Jewish real estate agent, took my hand in his vice like grip, stared into my eyes and said. “You make your profit on the buy, not the sell”. At first I thought it was simply weird old guy stuff, but the phrase stuck in my head and I realised he was right. When you at a reasonable price, you don’t have much option but to hold out for the sell price you want to maintain your required margin. But when you buy well, you can alter your timeline. i.e. if you need a quick sale, drop the price, if you don’t be relaxed and enjoy super profits. So the best way to buy well, is to buy for free. So how do you buy for free? I can think of a couple of ways. Indent Stock – You get paid when I get paid, you’re just using my premise as a warehouse. This is common in retail, and can be applied elsewhere. Buying the right to buy – Rights don’t normally get sold outside of equities, but doesn’t mean you can’t. I have seen someone rent a holiday house and pay 12 months in advance for the right to buy that property at a set price. Swapping – you don’t have to pay cash. Consider swapping for something you no longer value. Sharing the Yield – An interesting deal is sharing the yield. You obtain the right to sell something, for a pre-agreed share of the profits. Last week I talked about how I had come up with a better solution for syncing my calendar and contacts information across a variety of devices, including my windows based computers, iPhone and iPad. But I didn’t go into the actual mechanics. So without further ado, here’s the how to do it. To get my Google contacts automatically synced with the Thunderbird email client that I use, I downloaded the free Zindus “Google and Zimbra contact sync” for Thunderbird. Its simplicity itself to install. Inside Thunderbird you click tools, add-ons then install then select the downloaded file. You then configure it inside Thunderbird, by selecting Tools | Zindus (its a new option that has appeared), and adding your Google Mail account and password. The two systems then keep themselves sync’ed without any interference. 2. Double ups of information generally occur as people switch jobs, and email addresses. Google Mail has a lovely tool to find the “double-ups” and fix them up for you. The second area where I want to Sync with Google is with my calendar. I use a product called Lighting, which integrates with Thunderbird. I downloaded the free Google Calendar Provider and installed it the same way I installed Zindus above. By selecting Tools | Add Ons | Install inside Thunderbird. When you run Lighting, click the calendar icon in Thunderbird, you can then create a Google Calendar “feed” to be displayed. To create the Calendar feed select File | New | Calendar. You then select Google Calendar and enter the Calendar location. The Calendar location can be found by going to your Google Calendar in a web browser, selecting Settings | Calendar Details and pressing the XML button for the private address. Cut and past this address into Lighting and Voila! Your Google Calendar and Lightning Calendar will automatically sync with each other. The lovely thing is I can repeat this same setup on every device I may touch, and they will all automatically sync without getting confused as Google is always the “source”. I can also go to my Google account and see my up-to-date calendar, contacts and send email if I drop into an internet cafe. Although I don’t use Microsoft Outlook, the same principle works there as well. There is a great article here on how to set it up with links to the free software. Both the iPhone and iPad are pretty much identical to setup. Its a two step process. The first step is to add your Google Account, the second step is to tell the device which calendars you want synced – I have 9. To setup your Google account you go to settings on the device and add, here’s a tricky bit, a Microsoft Exchange Account (not the listed Google Mail account). This means you will access Google via an exchange server Google has licensed, which gives you the functionality you need to sync lots of accounts. The process is explained in detail, with pictures, here. With this one stroke you can setup eMail, Contacts and Calendar. Its also likely that you will delete any existing contacts you have on the device, but that’s pretty much a good thing at this stage. Just take a backup of your contacts first in a basic format such as csv (a comma delimited text file) and import these into your Google Contacts when you are done. Miraculously, Contacts will start appearing on your iPhone in batches. In my case downloading the 2,500 or so contacts normally takes a number of hours. I don’t know why it takes this long, but I don’t care. All I know is that it works. The second thing you will want to do is add additional calendars to Sync. On the iPhone and iPad, each calendar comes in its own colour and I can turn them on or off, depending on whether I want to see the big picture or just focus on one thing. Why I have multiple calendars, is something I have written about before, but won’t go into here. Instructions for setting up multiple calendars to Sync are published here by Google. Basically you just goto http://m.google.com/sync , login and select the calendars. The trick is to use the web browser on the device you want to sync as the Google Sync website recognises which device you are using to access it, and configures the available options automatically. This doesn’t just work for the iPhone and iPad, the Google Sync website also has instructions on how to make the hole thing happen with Android, Blackberry, iPhone’s Nokia’s and others. There was only a tiny bit of fiddling to get the whole kit and kaboodle working, but now that its done, it just works. So much so that I regularly find myself surprised when other people mention that they are having issues. Hope you find it useful too. During the school holidays I went down to the Morning Peninsula and spent time entertaining the children. I managed to get a kite up in the air for around 20 minutes, so I felt completely validated as a parent. While I was away I still managed to get a bit done courtesy of a small device I purchased, which I must say I thought was fabulous. Its a Netcomm 3G Wireless Router. About the size of a small stack of business cards card its a wireless access point and 3G router in a portable device. What it meant to me was that I had my own wireless hotspot that I could use at home or at a cafe. I could also access the internet using my notebook and my iPad at the same time. I purchased a plan from Optus giving me 2Gb of data for $20 a month. So far I haven’t blown this despite the fact I have spent a spare bit of time web surfing and pulling down emails with attachments, but not watching videos though. The speed was of course slower than what I was used to, but seemed to depend on where I placed the device in the house. I Also liked the fact that I could put these charges on my Optus mobile phone bill, and not generate extra paper. However in hindsight if I keep going to the country, I should probably switch over to a Telstra account as they appear to have better coverage in regional areas I like such as Warrnambool and Lakes Entrance. It also come in a bit handy when I overnight in Sydney. It galls me to pay $26 for 24hours internet access in my hotel room, when I I want is to quickly check my email. Setting up was really easy, other than having to know the name of the network I was trying to attach myself to. Unfortunately Optus had more than one option and because it was slow to change itself, I became quickly confused when everything I tried, and I’ll admit a little impatiently, didn’t work. At $299 it was a little pricey, but I would expect that to come down a bit as soon as it has competitors in the market place. The kids loved it to as a lot of the games they pay on the iPad require internet connections and stand alone games just don’t seem to cut it for them. All in all I’d give it an 8 out of 10 as a handy gadget. I just spent a week down on the Mornington Peninsula with the kids over school holidays. I tried to keep my mind on Kite flying and mucking about at the beach, but I came a across a small business that I found just fascinating in how they generated their revenues. On first glance it appeared to be a games arcade with lots of video games and machines that you thump, prod or throw balls in. I was surprised to find that they didn’t have much food or drink for sale, but they did have lots of prizes in cases you could win. It may sound weird but at the end of half an hour or so, I suddenly had an epiphany about their business model. They weren’t selling arcade games, they were selling primitive plastic gifts at outrageous margins. We purchased tokens from a machine, to put in the arcade games. Roughly $1 per token with a volume discount (eg. 6 tokens for $5). When you finished the game (or even part way through) the arcade game started spitting out a string of tickets, the length depending on your score. 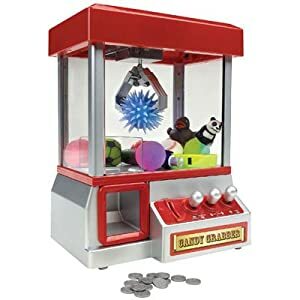 At the end of playing all the games, you gathered up all your tickets and fed them into another machine, which spat out a receipt with the number of points you had earned. You swapped the the receipt for a prize (eg 10 points got you a sticker book, 40 points got you a tiny plastic pool table). A $15 metal car was worked out to $250. Tiny Sticker Book worth a dollar worked out to $10. and a single lolly worth 50c was $1. The business model innovation of turning the purchase into an experience and abstracting the cash spend from the purchase, allowed them to generate super profits in a traditionally highly competitive commodity market. Makes me wonder what lessons I can find here for improving margins in my business?